Firstly can any one help? I have had this request, where is Fred? I recently had lunch with two other former Patrol Leaders from the 62nd (1963-1967) who now live in north Wales and on the Isle of Wight. The three of us moved on to a Senior, later Venture Scout group housed in a Nyssen hut sub-leased from Portsmouth Rugby Club at the former war-era army barracks at Hilsea. The leader was Fred Hellyer, at the time in his thirties and living with his family on Hilary Road in Cosham. I was wondering whether you or any of your local contacts might have any information about Fred and what became of him beyond about 1969, when the three of us left the scouts and the area. 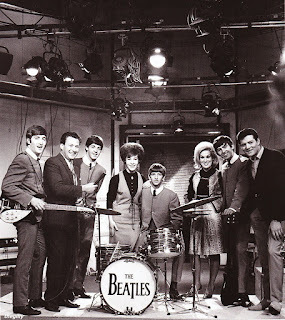 Third Picture: The Beatles, Helen Shapiro, Dusty Springfield, Eden Kane and Keith Fordyce on the set of RSG! Having Last week dealt with Don Lang who appeared on the 6-5 Special which was an hour programme and which ran for 97 episodes, it is time to look at the ITV challenger Ready Steady Go which was only 30 minutes long for the first year and was extended to 50 minutes later and it lasted 52 episodes. It was broadcast every Friday night from 1963 during its run until it ended on 23/12/1966. 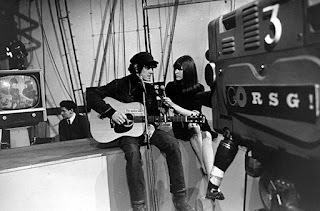 Presented by Keith Fordyce and Cathy McGowan it featuring many performances by The Beatles, Rolling Stones, Mick Jagger, Dusty Springfield, Del Shannon, the Animals, the Rolling Stones, the Beatles, and Dave Berry and The Who amongst other 60's greats. It had a simple formula – to showcase artists from both the UK and USA (usually miming), alongside an audience who danced or stood around during the performances. Performers were declared live from 2nd April 1965 when lip syncing was abolished. Cathy MacGowan was an irritating, mini-skirted, giggler, while Keith Fordyce would have looked more at home as an assistant in a furniture shop – still, it was a start and pre-dated Top of the Pops by a few years. 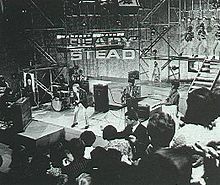 Big names who appeared on Ready, Steady, Go, included Dusty Springfield, Del Shannon, the Animals, the Rolling Stones, the Beatles, and Dave Berry. The theme tune was provided by Manfred Mann (the catchy 54321). Perhaps it was not the most inventive of music shows – and suffered from the miming aspect which made most artists look ridiculous as they lip synched to a track which resounded around the huge space. It was hardly definitive but was the first attempt on British TV (after 6-5 Special) to provide a weekly showcase for the movers and shakers of popular music. As Cathy MacGowan would say, 'The weekend starts here …'. The programme was broadcast every Friday and was conceived by Elkan Allan, head of Rediffusion TV. He wanted a light entertainment programme different from the low-brow style of light entertainment transmitted by ATV. The programme was produced without scenery or costumes and with a minimum of choreography and make-up. The programme was produced by Associated-Rediffusion, the weekday ITV contractor for London, called Rediffusion-London after 1964. The live show was eventually networked nationally.The show gained its highest ratings on 20th March 1964 when it featured the Beatles being interviewed and performing "It Won't Be Long", "You Can't Do That" and "Can't Buy Me Love" - the last a hit at the time. In the 1980s Dave Clark of the Dave Clark Five acquired the rights to the 1960s UK music show and bought the rights to the surviving recordings. In 1965 the programme was parodied in The Benny Hill Show where Benny Hill impersonated Cathy McGowan, Peter & Gordon and a singer named P. J. Orbison (the amalgam of the names of P. J. Proby and Roy Orbison). Although not actually mentioned by name. Ready, Steady, Go! was parodied in the 1967 film Bedazzled featuring comedians Peter Cook and Dudley Moore (who both had appeared on Ready Steady Go). The song used was filmed on the actual Ready Steady Go set in late 1966. In the mod film Quadrophenia, the main character is watching the Who perform on Ready Steady Go!. In episode 3 of Alan Plater's 1995 TV drama Oliver's Travels, Oliver (played by Alan Bates) says "Ready, Steady, Go! ", to which his B&B hostess (played by Molly Sugden) replies, "If you're old enough to know that, you're as old as you look." English group Generation X wrote a song about the show "Ready Steady Go" in 1978, which made various references and had the lyric "because I'm in love with Cathy McGowan". As part of the Southbank's Meltdown Festival 2011, curator Ray Davies recreated Ready Steady Go on Saturday 11th June. Looking back it is very lucky that some of the original ideas never were instituted. Their early intentions were to present the main show to an audience of about 150 inside Rediffusions London studio at Television House, Kingsway, where compere Keith Fordyce would introduce the artists, with additional activity in the lobby where his Canadian co-host, David Gell, would chat with audience members about their personal current favourites. Other ideas for show considered at the time included: selection of one of the invited audience members to be an amateur disc jockey; giving someone the chance to win that week's Top 50 singles; blindfolding members of the audience and getting them to try and identify a current chart hit; and having a weekly section with 'showbiz' news items. Thankfully, all these were dropped and the production concentrated largely on the artists and dancing inside the studio itself. It's a lovely warm day in Johannesburg and I have just read your Blog of the week. I noticed the picture of the Solent Road teacher Mr Wing "Pop" as we called him. It set me to thinking on the other school teachers of that era the 50's. I had in succession the following Form teachers. Mr White, Mrs Magee and Miss Moore. Mr White was strict and wielded the cane occasionally. He gave us all a model animal at year end. Mrs Magee was much easier and used to bring her corgi to school (imagine that being allowed now). Miss Moore was as hard as nails to the point of extreme cruelty I will say no more on this I have written about it before. Other teachers I remember were "Doc" King who sported an RAF style mustache a bit scary but really rather a good teacher. Les Rose our PT teacher and would today be in trouble........Mr Hawkins our headmaster, another slightly scary bloke who would fill in occasionally when a teacher was off sick. We enjoyed the finest education in those days as a result of the 1944 Education Act. The education system has been tinkered with by successive governments to the point that the UK has gone from the best in the world to well down the list. The Education Act of 1944 was authored by Conservative Rab Butler and known as "the Butler Act", it defined the modern split between primary education and secondary education at age 11; it also established the Tripartite System, consisting of grammar schools, secondary modern schools and secondary technical schools. Academically gifted students who passed the "Scholarship" exam (later replaced by a "Grading Test" and the 11+ examination) were able to attend a grammar school. Children who did not pass the selection test attended secondary modern schools or technical schools. The school leaving age was raised to 15. The elite system of public schools was practically unchanged. The new law was widely praised by Conservatives because it honoured religion and social hierarchy, by Labour because it opened new opportunities for the working class, and by the general public because it ended the fees they had to pay. In 1965 the Labour government started to mess around with the Education System and required all local education authorities to formulate proposals to move away from selection at eleven, replacing the tripartite system with comprehensive schools. The introduction of such schools was resisted by many Local Education Authorities. The changes were finally put into effect by the Direct Grant Grammar Schools (Cessation of Grant) Regulations 1975. Some schools (almost all Catholic) became fully state-funded, while the majority became independent fee-paying schools. In this same period the school leaving age was raised to 16 and saw the introduction of the Education (Work Experience) Act, allowing LEAs to organise work experience for the additional final year school students. In some counties around the country, these changes also led to the introduction of Middle schools where students were kept at primary or junior school for an additional year, meaning that the number of students in secondary schools within these areas remained virtually constant through the change. Many secondary schools in areas without a Middle School were unable to accommodate the new 5th year students. The solution to the problem was to construct a new building for these schools (often referred to as "ROSLA Buildings" or "ROSLA Blocks") that needed to extend their capacity. providing them with the capacity to cope with the new generation of ROSLA students. The "ROSLA Buildings" were delivered to schools in self-assembly packs and were not intended to stand long-term, though some have proven to have stood much longer than was initially planned and some are still standing now. -The National Curriculum was introduced, which made it compulsory for schools to teach certain subjects and syllabuses. Previously the choice of subjects had been up to the school. -Formula funding was introduced, which meant that the more children a school could attract to it, the more money the school would receive. On 04/12/1960 the number one single was It's Now Or Never - Elvis Presley and the number one album was South Pacific. The top rated TV show was Armchair Theatre (ABC) the first episode of Coronation Street on shown and the box office smash was Psycho. A pound of today's money was worth £13.68 and Tottenham Hotspur were on the way to becoming the Season's Division 1 champions. On 04/12/1961 the number one single was Tower of Strength - Frankie Vaughan . The top rated TV show was Coronation Street and the box office smash was One Hundred and One Dalmations. A pound of today's money was worth £13.25 Ipswich Town were on the way to becoming the Season's Division 1 champions. The big news story of the day was Sunday Night at the London Palladium (ATV). On 04/12/1963 the number one single was She Loves You - The Beatles and the number one album was With the Beatles - The Beatles. The top rated TV show was Coronation Street and the box office smash was The Great Escape. A pound of today's money was worth £12.64 and Liverpool were on the way to becoming the Season's Division 1 champions. Christine Keeler arrives in prison to serve her sentence of nine months for perjury. On 04/12/1964 the number one single was Little Red Rooster - Rolling Stones and the number one album was A Hard Day's Night - Beatles. The top rated TV show was Coronation Street and the box office smash was Dr Strangelove. A pound of today's money was worth £12.24 and Manchester United were on the way to becoming the Season's Division 1 champions. Poet Edith Sitwell dies. On 04/12/1965 the number one single was The Carnival is Over - Seekers and the number one album was The Sound of Music Soundtrack. The top rated TV show was Coronation Street and the box office smash was The Sound of Music. A pound of today's money was worth £11.69 and Liverpool were on the way to becoming the Season's Division 1 champions.